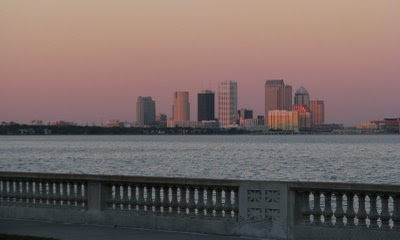 The dramatic view of downtown Tampa from Bayshore Blvd. looking toward the eastern sky at sunset. The moon was brightly reflecting at sundown tonight. 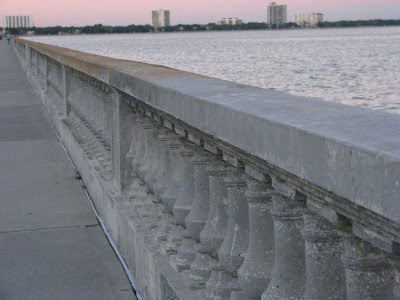 The seven mile stretch of Bayshore's sidewalk and balustrade seawall that borders Hillsborough Bay. i have some memories of that bvld. for sure. i once ran a 6 minute mile on that as a teen. we use to go run the bayshore when i went to bums/bayshore united methodist school. the red tide at times was so overwhelming. then the walks with walk for life. as a women i exercised and got therapy while dh was hospitalized. i know that skyline well. 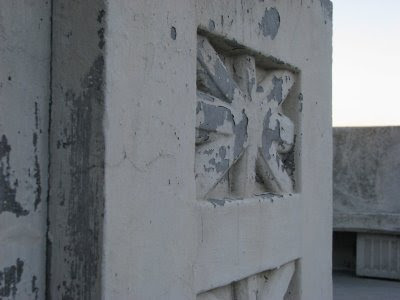 our area has many unusual architectural sites. i am sure we will be seeing more of them on your blog. some of our citizens pay high tax dollars to live with this view every day. and it is always a nice drive with an out-of-town guest. most days it is crowded with walkers, joggers, roller-bladers, bicycles and sightseers. it is the famous route of our annual Gasparilla Parade, with the pirates and floats and bands filling the street. the bay is filled with hundreds of boats accompanying the infamous pirate ship as it comes to claim the City of Tampa as its territory! many a famous dignitary has been our grand marshal for the event. of course, this skyline view is one our chamber of commerce features in many of its appeals to tourists world-wide. you should submit some of your pics to them! Marmee, Your memories are mixed with emotion on either side of good and bad. It is a beautiful stretch of concrete next to the softscape of water in any case. A place where the soothing scenery alone could provide some measure of healing if needed. Gigi, Thanks. You said all the text I was too tired to type when I published this post. Gasparilla is about to descend upon the city in a couple of weeks. It won't look anything like the serene setting I captured last night. Loving the new blog Meems. 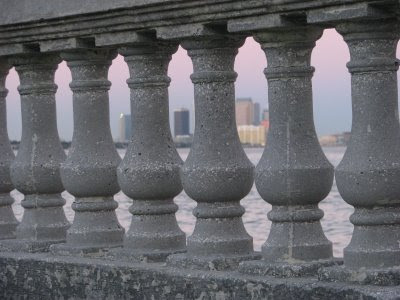 I love that Bayshore skyline. Brings me back to days of rollerblading. Great memories. N. T., Thanks for popping over you! I'm honored. Oh the days of rollerblading the Bayshore with you. It's been a while since I've done it there even... I was just talking to my oldest grandson trying to wrangle him into going with me... brought back memories for me too. The moon this past weekend was the most fantastically brilliant one, I believe, I have ever seen. I was drawn to the window numerous times to enjoy how it illuminated the dark night. It was so bright I actually thought it was possible to garden by moonlight. Love this post...again, the photos are so precise that they bring memories of scent to my nose...nothing pleasant mind you...fishy smells, ew. But I love the pics you took and think I'm really going to dig this new blog. So cool to wonder what of my beloved state will appear next, likely to be something I've come to ignore out of familiarity that your magic touch will make appear new. Thanks, MEEMS!